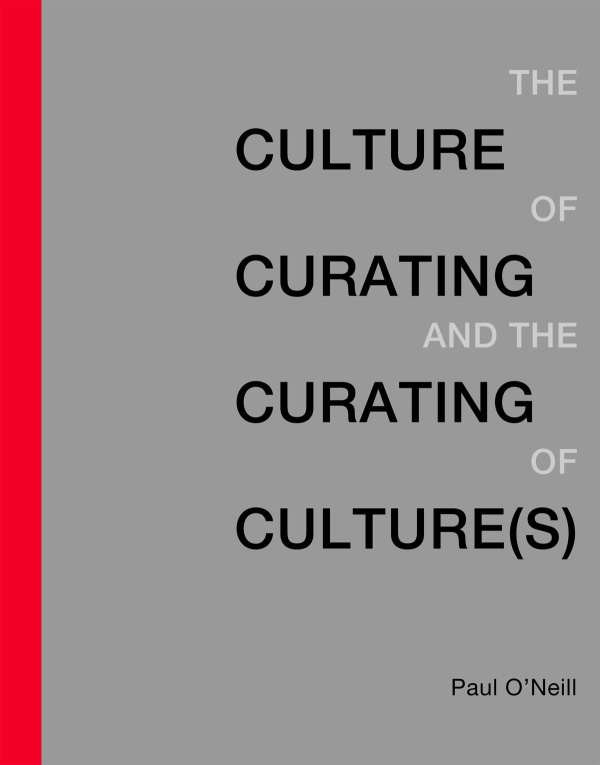 Published late last year, The Culture of Curating and the Curating of Culture(s) by Paul O’Neill attempts an analysis of the increased importance of the curator as author within cultural production, presenting curators as the agents responsible for the production of value within exhibition history, and defining curated group exhibitions since the 1980s as the creative work of curator-auteurs.1 The main thrust of the argument focuses on the shift from the primacy of the artist to that of the curator in the late 1980s, which O’Neill identifies with a change in the understanding of the role of the curator: no longer seen as the carers of institutional collections, curators would instead become the authors of a critically engaged and experimental form of exhibition practice.2 The title The Culture of Curating and the Curating of Culture(s) refers to Gerardo Mosquera’s conception of ‘an asymmetrical relationship between “curating cultures” and “curated cultures”’.3 Writing in 1994, Mosquera argued that globalisation had introduced ‘the illusion of a trans-territorial world of multi-cultural dialogue’, in which power continues to be exercised from an artistic centre located in the major metropolises of the West, which integrates art from peripheral countries whilst organising it within a Western-centric criteria, therefore maintaining the existing hierarchy.4 O’Neill stresses the imbalance of power hinted at in the title, affirming that ‘transcultural curating can always be used as a political tool to integrate curated cultures into the established Western canon’.5 However, in so far as O’Neill’s book legitimises the consolidation of the curator as producer of artistic discourse with largely Western historical precedents, it fails to question the status quo. In so far as O’Neill’s book legitimises the consolidation of the curator as producer of artistic discourse with largely Western historical precedents, it fails to question the present status quo. In this way, O’Neill aligns himself with the criticism already levelled at ‘Magiciens de la Terre’ since 1989 on the grounds of its neo-colonial approach, arguing that Martin applied the ‘rhetoric of postmodernist “pluralism” of the time’, rather than the postcolonial methodology developed by later curatorial approaches.12 However, he eventually concludes in favour of Martin’s curatorial position as an early attempt to encapsulate cultural heterogeneity, in which the curator accepted that ‘his “ethnocentric” vision [was] an inevitable and inescapable side effect of his own distant pluralistic approach’.13 Indeed, as O’Neill notes, ‘Martin claimed that an “objective, unacculturated” perspective or a “decentered” point of view was impossible’ and ‘ethnographic and hegemonic criterion for selection […] inevitable’.14 O’Neill’s analysis of the homogenisation prompted by a globalised art world finds itself in a similar problematic. He argues that contemporary transcultural curating seldom takes into account localities outside the mainstream Western discourse, while at the same time justifying his own Western approach as an attempt to understand this kind of curatorial practice. The third chapter builds on the proposition ‘curator-as-artist’ offering an account of the hierarchies at play in the production of contemporary art practice and discourse – namely, the tensions between curatorial intervention and artistic autonomy. Rejecting Theodor Adorno and Max Horkheimer’s account of a fixed division of labour between the artist as agent of cultural production and the manager (or curator) as an administrator,15 O’Neill argues for an overlap of roles: curatorship is seen instead ‘as a far-reaching category, encompassing various organisational forms, cooperative models and collaborative structures’ including ‘generative properties traditionally attributed to artistic production’.16Such blurring of boundaries is the crux of his argument. However, as befits his attempt to overview, the sub-chapter ‘Antagonism to the New Curatorship’ mentions the counter-position raised by authors and curators such as Bart de Baere, Robert Storr, Alex Farquharson, Maria Lind and Irit Rogoff.17 Storr, for instance, is brought to our attention for dismissing curating as a mode of authorship,18 while Rogoff and de Baere are mentioned for suggesting that too often curators dictate modes of participation to the audience ‘in the guise of a democratisation of a cultural experience’.19 Their critique of the ‘curator-as-artist’, is dismissed by O’Neill as reinforcing an unproductive traditional division of roles between artist and curator. Can the professionalisation of curating contribute to an increased criticality of curatorship? O’Neill’s emphatic affirmation of the curator-as-artist contrasts with the more pluralistic approach of his previously edited volumes, Curating Subjects (2007)20 and Curating and the Educational Turn (2010),21 which he edited with Mick Wilson, compiling a series of essays by different artists, curators and academics with the aim to expand the terms by which we approach curatorial practice. Whereas the anecdotal qualities of these previous readers offered an accessible route into various issues at stake in contemporary curatorship, O’Neill’s attempt at surveying the heterogeneous field of contemporary curatorial practice and discourse in a single volume inevitably fails to account for its complexity and can be rather read as an attempt at validation. And yet, given the large number of symposia and books on exhibition-making and the ‘curatorial’ that have recently been published, it is worth asking whether curatorial practice is in need of such legitimisation.22Can the professionalisation of curating contribute to an increased criticality of curatorship? And if so, how can the legitimatised curatorship contribute to the development of art now? Whereas O’Neill rightly identifies one of the main challenges of current curatorial practice – how to account for the diversity of artistic practices at a global scale – his legitimation of the curator-as-artist from a Western perspective serves to affirm rather than question the ‘curating culture’ and its discourse. Hyo Gyoung Jeon and Ambra Gattiglia are graduates of the MRes Art: Exhibition Studies at Central Saint Martins College of Art and Design, University of the Arts London.